One of the benefits of SWI Membership is the opportunity to participate in Work Teams that help define, review, test, and/or implement our projects. Each project will have different needs and some will have different phases of opportunity. The needs for each project will be defined as the projects are set up. 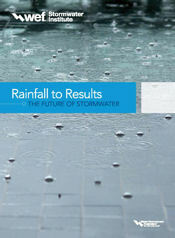 The first action of the WEF Stormwater Institute is the release of Rainfall to results: The future of stormwater, a comprehensive report detailing the challenges, opportunities, and pathways to achieving sustainable stormwater management. The report release at the 2015 WEFTEC Stormwater Congress in Chicago coincided with the official launch of the WEF Stormwater Institute. Click here for more information and to read the report. Stormwater Institute © 2019. All Rights Reserved.